A veterinarian is asking the increasing number of people with GPS phones to send in reports of dead animals on California roads, The New York Times reports today, in order to devise ways to prevent the accidents. 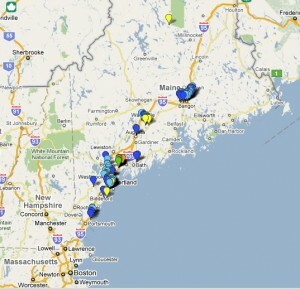 Similar roadkill map projects are popping up all over–Maine, New Brunswick, Tasmania, Iowa. Brewster “Dr. Splat” Bartlett has been encouraging kid scientists to track roadside dead animals since 1982. Wildlife watchers would obviously rather have a live sighting map to go on, but can you use these maps to tell you where to look for animals? I’ve tried the technique in New Brunswick, which maps moose collision hot spots. I didn’t have any luck, though the map did give me a lot of good starting points. Then again hunting season had begun, so moose were wary. Truck drivers in New Hampshire’s Moose Alley say the time they’d seen the most moose–and moose accidents–was just before down and I didn’t go out then. The citizen scientist maps have another problem: the data is thickest where volunteers are. I doubt Sacramento is more of a wildlife haven or death trap than LA, but that’s the way it looks on the map because that’s where the lead scientist is. Wildlife watchers already instinctively use animal auto crash data, whether they know it or not. Those signs that say “Moose Crossing Next 17 miles”? There’s really something to them. They’re where transportation engineers noticed the most crashes. That’s not to downplay what the maps all show and hope to prevent: a shocking number of animals die in auto accidents every day. They’re mainly common animals–squirrels, sparrows, deer, raccoon, skunk–but around the world car traffic does threaten endangered Mexican wolves (causing 19% of deaths), sea turtle hatchlings, frogs, crabs and everything else. The Times uses the Humane Society of the United States’ estimate of 1 million animals a day. But as Mark Matthew Braunstein pointed out, that data is from the 1970s–absurdly stale. State Farm estimated last year that Americans had 2.4 million collisions with deer, not mentioning how many were fatal to deer, but I’d guess most. We’ve done lots of good things to prevent car accidents with animals, but the sheer number of cars has gone from 111 million vehicles (including trucks and buses) on the road in 1970 compared to 255 million in 2008, the last year the Bureau of Transportation Statistics calculated. By that measure, it’s not unreasonable to think that it’s really closer to 2 million animals a day getting run over. 1 comment to Can Wildlife Watchers Use the Increasing Number of Roadkill Maps? whoah this weblog is magnificent i really like studying your posts. Keep up the great work! You realize, lots of people are looking round for this info, you could aid them greatly.